A massive search operation is continuing at sea for a woman who fell overboard from the P&O Pacific Dawn. It's understood the woman had walked outside to be sick, when a large wave hit the liner causing her to plunge into the water on Thursday afternoon, about 150 nautical miles west of New Caledonia, her distraught husband reportedly witnessing the horrific incident. 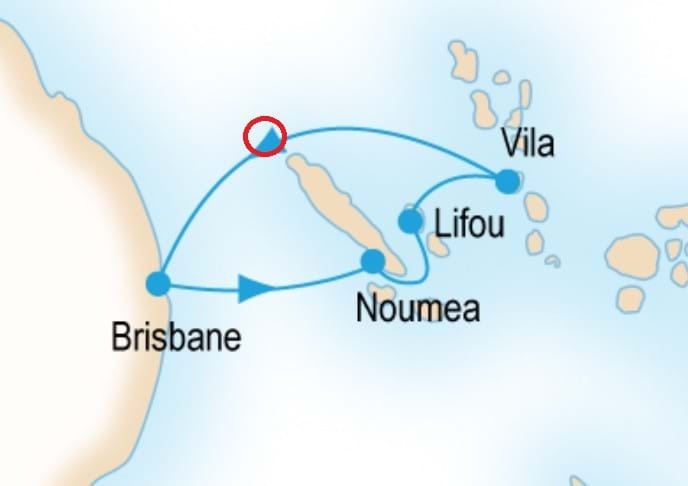 Pic: The cruise's journey route; the red circle indicating the incident area. The 'man overboard' signal was set off almost immediately with several life rings being thrown into the water, sadly there was no sign of her. Other passengers have since taken to Twitter to say the ship has spent the night circling the area in hopes of locating the woman, but 5-6 metre waves are hampering efforts. "Horrendous here on ship," passenger Jonathan Trevithick posted on Thursday. "Man over board an hour ago. Ship going round and round searching." The Australian Maritime Safety Authority reportedly issued a plea for nearby vessels to assist in the search, but currently they are trawling the area alone. The ship is supposed to be docking in Brisbane tomorrow and it's unsure at this stage how long the search will continue. P&O released a statement on Friday, saying "the cruise line's thoughts and prayers are with the family of the missing guest at this distressing time".